We left Sanibel Island on Christmas Eve, heading 80 miles north to Venice in order to spend Christmas with Rosemarie’s mom, Gloria and stepdad, Bill. When in Venice we tend to spend a couple of the days in their driveway, but the bulk of the time at Rambler’s Rest RV Resort so as not to wear out our welcome. We first stayed at Rambler’s in our first motorhome for a rally with the Sunshine Statesmen GMC club, and impressed with the park we have come back a couple of times each year for the same reasons we come back to Periwinkle in Sanibel: a real and rare welcoming sense of community, with added bonus of getting the Passport-America 50% discount on up to two weeks there a year, excluding January through March. It is a large park with a couple of hundred sites, the bulk of which are near permanently occupied by “park models.” A park model, as I recently learned, looks like a small version of a pre-manufactured home, but is technically an RV, complete with axles and running gear underneath. 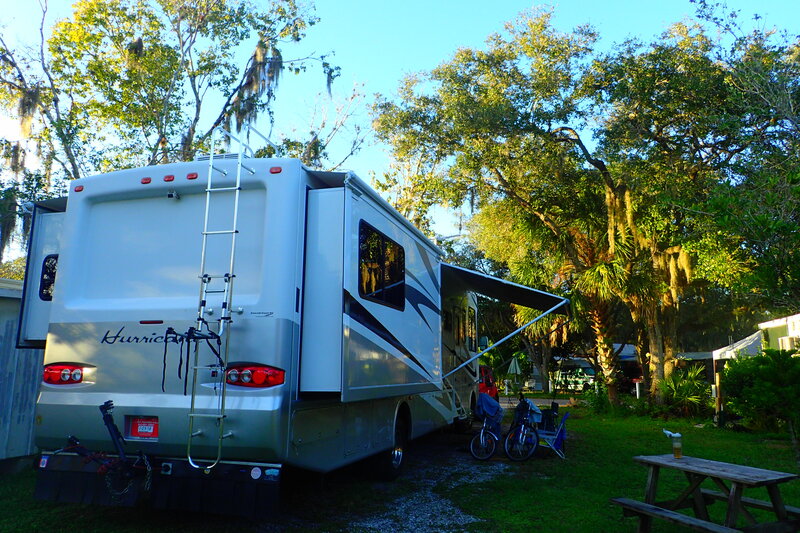 The advantage of this over a “double wide” mobile home is that they are not subject to property in Florida, and the restrictions and regulations on them are less onerous for both the owner and the park on which they sit. The disadvantage is the size; they are restricted to 400 square feet in most states, though Florida allows up to 500. This effectively means that you will have roughly a 12′ x 37′ foot home with a couple of popouts. Most owners tend to compensate for the limited size by adding a full length enclosed lanai along one side. 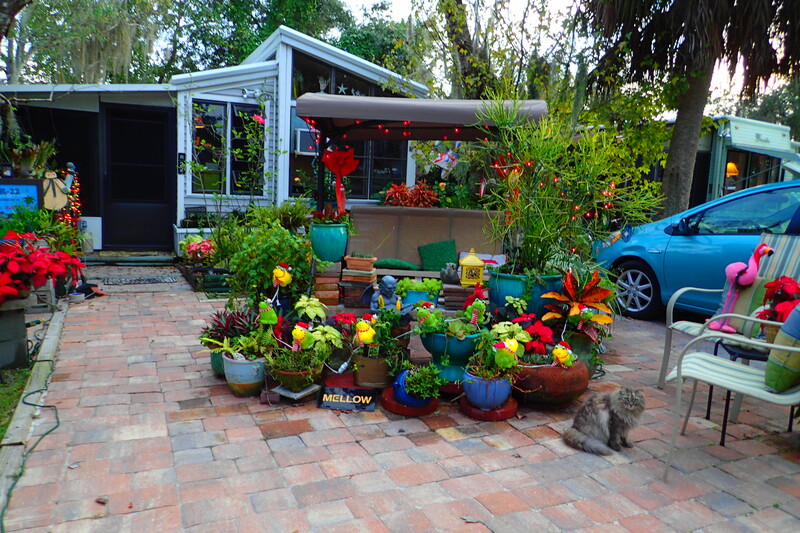 Our neighbor’s park model, festooned with decorations and plants. About a quarter of Rambler’s Rest is set aside for the more traditional type RVs: 5th wheels, travel trailers, and motorhomes. Most of these sites are together in the loops on the west side of the park, though there are a few spots scattered through the other sections as well. 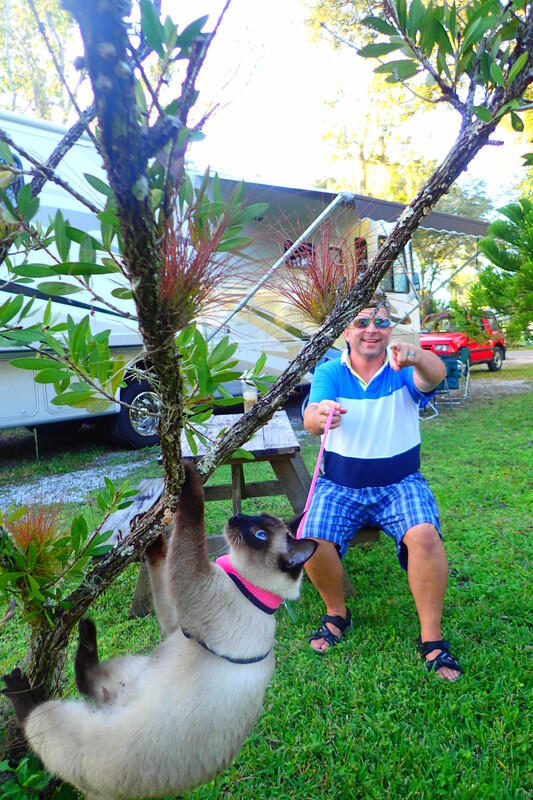 We always request a spot down near the Myakka River, finding that we enjoy the quick walk to the dock and the social atmosphere of that section, sacrificing proximity to the club house and pool. Our site during our most recent stay. 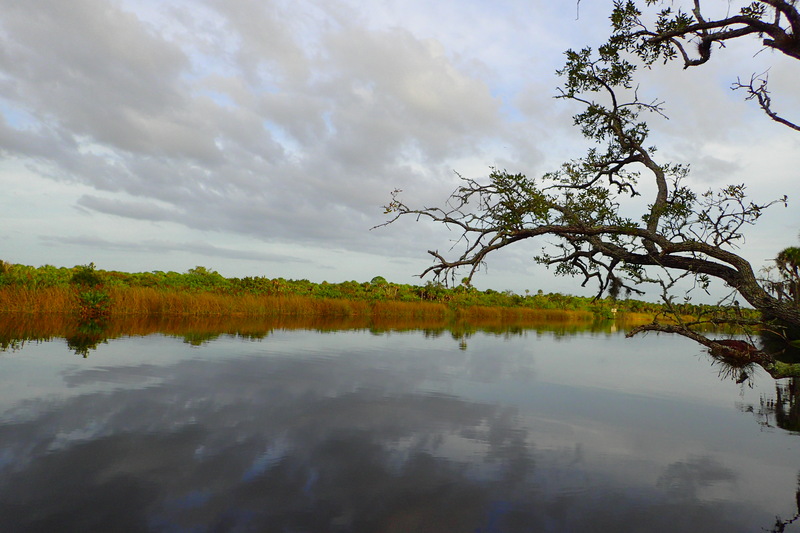 One of a handful available to traditional RVs near the Myakka River. Rambler’s Rest has a plethora of social activities, one of the reason we like to come here. With the holiday schedule and family events, we weren’t able to participate in much of them this year, but we made sure to get back to the park in time for the golf cart Christmas parade. This year 28 carts powered through every street on the grounds with heavily decorated holiday themed carts. We spent Christmas with Gloria and Bill, all of us pitching in to make Christmas dinner for the four of us plus their neighbors Chris and Tom. I made a turkey; brined and spatchcocked of course, while Bill and Gloria made all the sides, including gravy derived from the turkey parts and drippings. This meant a fantastic meal with lots of turkey leftovers from the 14 pound bird. We still have some 0f Bill’s turkey soup in the freezer. Pad Kee Meow inspecting the bird. Fresh from the oven, ready to carve. 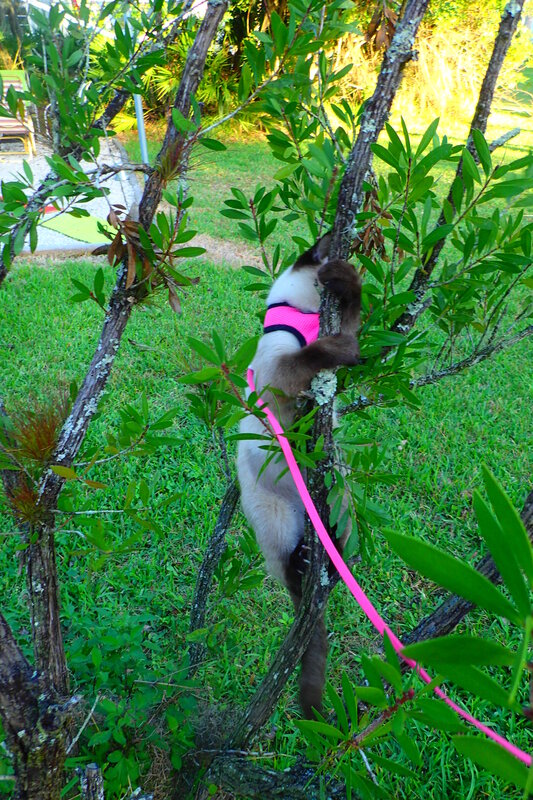 Yes, and it keeps happening, even on the leash she keeps climbing things to the full length of her rope.